It's time for a couple of quick reminders for singers! 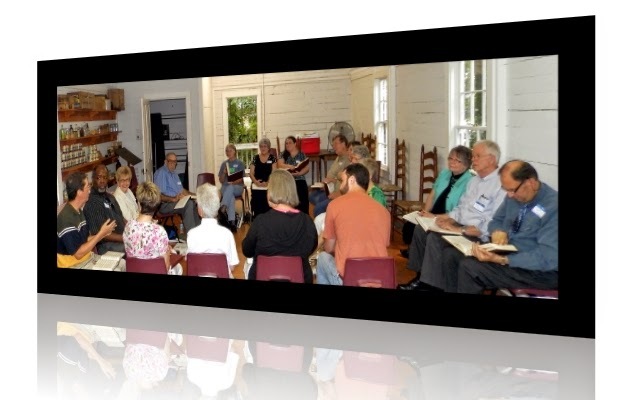 On Sunday, July 13th, at 1:30 P.M., the Shiloh Singers of Northwest Arkansas will host their usual 2nd Sunday Singing in the General Store on the grounds of the Shiloh Museum. Extra books are available for new singers and visitors to use for the afternoon and visitors are always welcome to drop by and listen, tap their feet, or join in with the regular singers as we sing to preserve an old-time singing tradition dating back to an era when early American churches lacked musical instruments The singing usually lasts until about 4:00 P.M.
Those who like chicken and dumplings or other gospel bird delights are invited to have lunch before the singing are welcome to join the "Shiloh Singers" table at AQ's Chicken House in Springdale around 12:00. There's usually room to add a few chairs or you can email me if you want us to save you a seat. After singing, those who want a snack or cup of coffee before driving home are welcome join us at the Springdale Denny's next to the Interstate. I hope that those who have time and who are in driving range will consider attending the Shape-Note Singing and Singing School to be held at the Ozark Folk Center in Mountain View on Friday and Saturday, July 11th and 12th from 9am to 12 Noon and from 1pm to 4pm on each day and enjoy all the singing. There's also a special Friday evening musical performance in the auditorium. Don't forget, if you plan to come to the Ozark Folk Center on those days for singing only, you can come in at no cost at the front entrance of the auditorium. Those who plan to visit other areas of the park may enter from the rear of the auditorium and join the singing too. Dan Brittain, one of the working leaders of the Ozark Folk Center event, sent his regrets about Sunday. He did send along a note with more information on the invitation to sing a number of selections at a University of Arkansas - Little Rock event opening a Johnny Cash exhibit on Friday evening, October 10th during an event from 5:00 until 8:00 P.M. If you live in the greater Little Rock area and are interested in singing at the UA-LR event, but cannot attended the 7/13 singing in Springdale, please send me a quick email and I'll be sure to take notes and share any of the details from Sunday's discussion with you next week. We need to get an answer back to the organizers at UA-LR.